Michael White ’18 is fascinated by social psychology—understanding how behavior is influenced by the larger social environment. What motivates people to give to charity? How do teachers create social connection in their classrooms? White is delving into these kinds of questions as an intern at the New York University Center for Behavioral Statistics and the Study of Motivated Perception. He is among 10 students selected from a pool of nearly 1,500 applicants nationwide. During the eight-week program, he’ll work with faculty to gain research experience and benefit from coaching that will prepare him to apply to graduate school. I’ll get to dive into a deep level of research that undergraduates usually don’t get to do. He’ll live in NYU dorms and looks forward to exploring the city for the first time—from Ellis Island to Broadway shows. 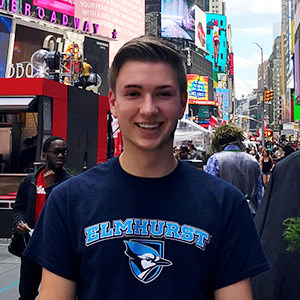 White, who grew up in Bartlett, became interested in social psychology when he participated in Elmhurst’s Keystone Program, which offers special opportunities to students who plan to pursue careers in math or science. White won a grant that enabled him to stay on campus the summer after his first year and work on research with Assistant Professor Elizabeth Majka. “That sold me on social psychology,” he said. White plans to pursue a Ph.D. and ultimately conduct research and teach at the college level.